JUST AROUND the corner from Larchmont Blvd. is the brand-new Midtown Bar & Kitchen at 5722 Melrose Ave. It wasn’t too long ago that the Hamburger Hamlet at 217 N. Larchmont Blvd. closed its doors after a brief go of it. Now, make room for another burger joint, Burger Lounge, which will be taking over the same space. Started in La Jolla in 2007, Burger Lounge sells itself as providing a simple, premium quality menu that appeals to health conscious diners, vegetarians and burger lovers alike. A sampling of menu items includes “The Classic” beef burger, as well as an “organic quinoa veggie burger” and a limited time “grass fed elk burger.” Also on the menu: fresh salads, French fries, onion rings, milk shakes, root beer floats and a signature sea-salted caramel brownie with whipped cream. Just around the corner from Larchmont Blvd. is the brand-new Midtown Bar & Kitchen, opened by Filippo Cortivo of Osteria Mamma and Osteria La Buca fame, and Max Mamikunian and Marko Shafer of Hotel Café. Cortivo and his mother, the “Mamma” and chef of Osteria Mamma next door, created an international tapas-style menu that favors the Italian side. 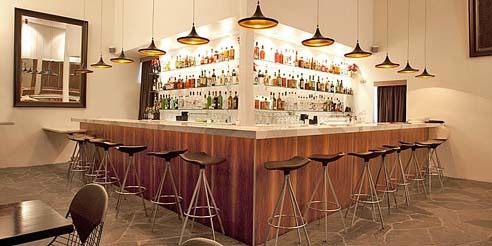 The space, designed by Mamikunian/Shafer, includes a full bar and large, comfortable booths to kick back and relax. The former Vine St. sushi spot Sushi Hiroba will soon be replaced by The Oinkster (also in Eagle Rock), chef Andre Guerrero’s “slow fast food” take on classic American fare. Construction workers have been hammering away at the Hollygrove-adjacent site for several months. Think of it as a retro fast food diner with burgers, fries and shakes, but also salads and sandwiches thrown in for good measure. The Oinkster aims to be the antidote to both the expensive gourmet meals and their cheap fast food counterparts. The restaurant’s $10 and under menu skips high prices in favor of better flavors and quality. Sandwiches are made with house-cured pastrami or slow-roasted pork, burgers of fresh-ground Nebraska Angus beef. Craft beer and wine are also on the menu, as are shakes and an assortment of cupcakes and other treats. Much to many local’s gastronomic disappointment, Buddha’s Belly on Beverly Blvd. abruptly closed its doors in September. Stir Market, helmed by Bryan Libit, will be replacing the former pan-Asian hotspot. Not too much is known yet about what Stir Market will have to offer, but permits show that Libit is planning to install indoor seating for 51, outdoor seating for 30 and provide beer and wine.